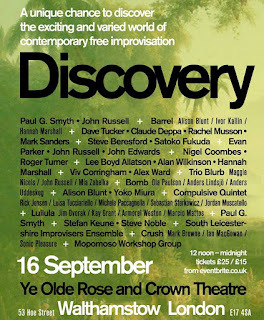 Ci saranno Alison Blunt, Hannah Marshall, Dave Tucker, Claude Deppa, Mark Sanders, Steve Beresford con Satoko Fukuda, Evan Parker con John Russell e John Edwards, Nigel Coombes con Roger Turner, Gina Southgate, Alan Wilkinson, Maggie Nicols, Viv Corringham, Alex Ward, Enzo Rocco con Veryan Weston, Jim Dvorak, Marcio Mattos, Steve Noble, il South Leicestershire Improvisers Ensemble e molti molti altri. Tutto in dodici ore, quasi fosse un flash mob, domani da mezzogiorno a mezzanotte nel piccolo ritrovo del Ye Olde Rose & Crown londinese: è Discovery, impressionante assembramento internazionale di campioni di improvvisazione, jazz, altre musiche e altre arti voluto da John Russell in omaggio anche al quartiere dove da qualche anno è andato a vivere, Walthamstow. Se non si trova posto, o non si è ancora paghi, la cosa continua il giorno dopo al Vortex per un nuovo appuntamento pomeridiano di Mopomoso. 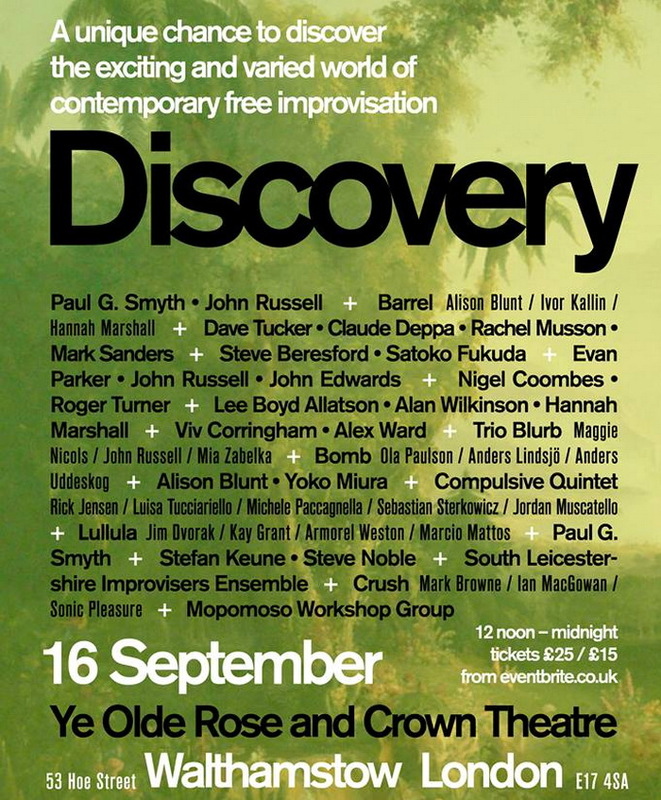 Musician run, and curated by guitarist John Russell, the event has over fifty musicians taking part from the UK, Germany, Italy, Sweden and Japan. A varied programme of both electric and acoustic music that should have something for all tastes, there will also be the chance to find new delights amongst the twenty sets happening throughout the day. Gina Southgate will be the official festival artist and there will also be opportunities to purchase CDs and other merchandise.